Remember those anonymous NFL executives who wanted you to believe that Joey Bosa’s rookie season was going to be a wash because he missed training camp and preseason? Remember how the Chargers thought it was a good idea to engage in a long and ugly contract standoff with Bosa over little things like offset language and bonus deferral? Bosa has proven them all to be big dumb morons. 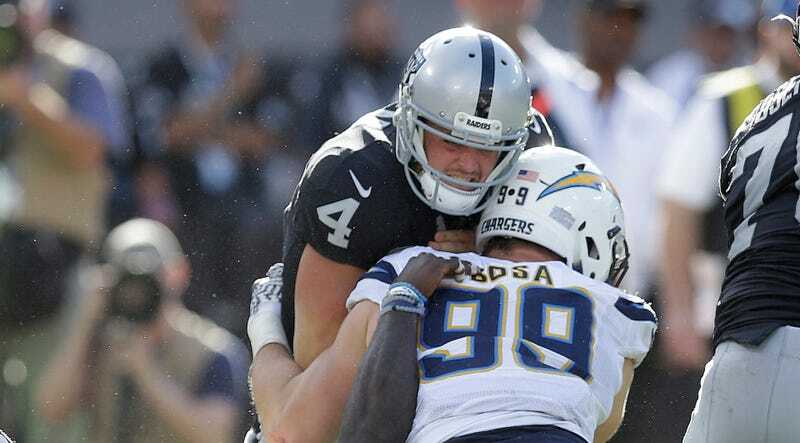 Pro Football Focus has given Bosa a grade of 86 through his first three games, which makes him the second-highest rated edge rusher in the NFL. He already has 20 total quarterback pressures and is on pace to enter The J.J. Watt Zone despite having missed the first four games of the season. The Chargers are now 3-4 in a division that seems much more winnable than it did before the Broncos dropped two straight. Who knows if Bosa would have been able to swing another game or two into the win column if the Chargers had gotten him on the field sooner, but it’s impossible to overstate how monumentally dumb it was for this team to rob itself of Bosa’s talent for the first quarter of the season. Whatever else the Chargers are, they are a team with a great quarterback and a defensive end who can disrupt an entire offensive scheme all by himself. The last decade or so of the NFL has been a lesson in just how ridiculously valuable those types of players are, and it’s not impossible to believe that Bosa and Philip Rivers can lead the Chargers on a surprise playoff push. If they fall short, the front office will have nobody to blame but themselves for those four Bosa-less games.